This contemporary silver oval pendant is set with black Cubic Zirconia stones. The approximate measurements of the pendant are 26mm length, 18mm width and 2.90g excluding chain. Available on your choice of silver chain. 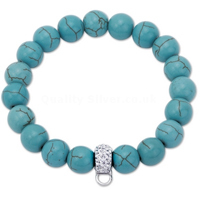 This can be bought with a matching bracelet to form a lovely silver jewellery set.